One of the most difficult parts of a survivor’s journey is recovery. For a long time, I rejected the entire notion of recovery – what did I need to recover from? I wasn’t addicted to anything. That was my own ignorance talking. Despite years of therapy for depression and anxiety, I had never really addressed how to recover from the childhood sexual abuse the next door neighbor perpetrated against me when I was eleven, or the aftermath of living with PTSD for decades AND how to live with it now. It’s the human experience to ask these questions. For survivors, we often find ourselves weighed down by this burden and the desire to move beyond it. Like anyone, we want to find meaning, discover joy, and fill our time on this rock in a way that’s fulfilling. To find our purpose. Many survivors (and people in general) tie our jobs with our purpose. One does not have to equal the other, though it can. This is a Western way of thinking – we equate what we do for a living with our purpose in life. However, the two can be entirely different. For example, my neighbor works a day job at a bank and then comes home and coaches soccer, his passion. Soccer gives him immense joy – banking does not. Then again, many survivors are creatives (in my case, a writer). As a survivor, advocate, and author, my purpose ties fairly seamlessly to my work as an author. The doors open to one another, and create conversation starters and jumping off points. For example, writing my first Broken book, Broken Pieces, inspired me to start #SexAbuseChat on Twitter, to help other sexual abuse survivors come together once weekly as a community to discuss various issues we face and how to deal with them. It’s not about me promoting my books (something I don’t do much on Twitter anyway) – it’s about making the most of my visibility to help others and create a place where they feel welcome., aka advocating, which helped me find my own purpose. Being an author is only one part of publishing – because if you want to sell books, you truly need to see yourself as a publisher, not simply as a writer (but that’s a post for my business blog). Yet, writing books and advocating for survivors is not my day job. My day job is running my BadRedhead Media business, which pays my bills and provides for me and my kids. As a single mom, it’s important to know I have a steady income coming in. Being a solopreneur is tough, though I’m thrilled to finally be working for myself (I started in 2011) after working in Corporate America for 17 years. As I researched for a Twitter chat on finding our purpose, I came across this wonderful article on Verily Magazine by Jodee Virgo, MFT, with this fabulous list she often uses with clients who are flailing about or stuck. I suggest working on one or two questions a week (this isn’t a process you must rush) and writing in your journal (if you aren’t journaling yet, start). Journaling can be anything you make it – a word, a sentence, doodles, photos, letters to yourself or others, poetry, thoughts, or just plain what you did that day…whatever works for you. 01. What did you love to do as a child? 02. Where does your mind drift when you daydream? 03. Where and when do you feel the happiest? 04. When do you feel like your best self? 05. What do you value most in other people and yourself? 06. What inspiration, idea, or vision keeps coming to you? 07. Who inspires you with their passion and purpose? 08. If you could do anything in the world without worrying about time, money, or energy restrictions, what would you do? 09. What’s not working in your life? 10. What do you do most naturally, with effortless ease? 11. What would your future self say to the present you? Now that you’ve identified a few areas you want to focus, you have more of a sense of direction. As I discuss with writers stuck on the concept of author branding, finding your purpose is kind of (well, very) similar. What topics are you passionate about or an expert in? What are you naturally drawn to or have a talent in? Research them. Write about them. And when you’re ready, share them. We’re human, which means we’re innately curious about life. We may have a myriad of interests, yet eventually, we find our way. Something slams into us with a huge force and says, this is it, dummy. Whether that’s a positive or negative force, it’s kinda hard to miss. Purpose doesn’t have to be some lofty, pie-in-the-sky unreachable goal. If your purpose is getting out of bed every day, cool. Your purpose can change and grow as you do. Here’s what I mean: I in no way thought being sexually abused as a child would ever turn out to be a good thing. Still don’t. However, somehow I’ve been able to merge my writing, strength, resilience, honesty, vulnerability, compassion, anxiety, depression, PTSD, and advocacy all into one big smushy thing I refer to as my purpose. It’s a mess, but it’s my mess. And when I decided to share my purpose, I did. 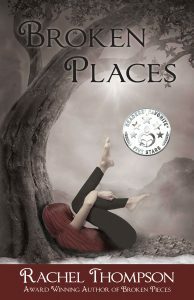 Read more about Rachel’s experiences in the award-winning book, Broken Pieces. Broken Places, available in print everywhere! Before I started following you, I wanted to forget my sexual abuse ever happened. I don’t like thinking or talking about it. But those thoughts intruded, and made me miserable. So I wrote about it. It was difficult, but it helped. You’ve helped a lot of women come to grips with this horrible thing that happened to us that we can never escape. Thank you.